Clean, reliable electric power from the industry leader in idle reduction technology. Introducing the new TriPace APU. 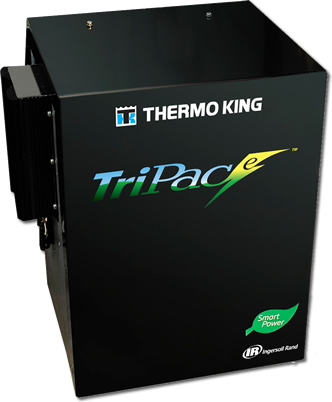 The TriPace delivers what Thermo King customers demand – true cost savings, reliable performance, clean operation and an easy-to-use control system. An electric, battery-powered APU system, the TriPac starts saving you money from day one and delivers serious savings month to month no matter how fuel costs fluctuate. Designed specifically for the TriPace, the NXT Battery harnesses dry cell technology to guarantee increased unit runtime, greater efficiency and a lower life cycle cost. An electric, battery-powered APU system, the TriPace starts saving you money from day one and delivers serious savings month to month no matter how fuel costs fluctuate.